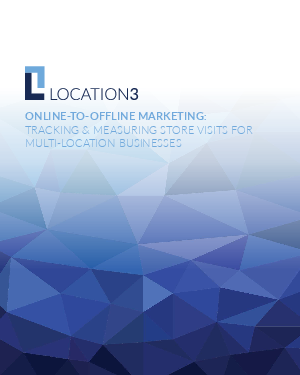 When we released our first white paper in February 2015 discussing the ways multi-location businesses were using online media to drive in-store visits, most of the strategic opportunities being leveraged by marketers revolved around using things like promotional coupons, beacons and other tactics. While those methods certainly provided incremental lift in in-store traffic and revenue, there existed a number of gaps in connecting online data associated with promotional efforts, to data that indicated a customer actually converted offline at a business location. At press time for our original “online-to-offline” white paper, digital industry giants were still very much in the early stages of evaluating data points that signified offline customer conversions. Many of these “conversions” were somewhat implied (i.e. Clicks on “Get Directions” link), while others were a bit more reliable in signifying in-store visits and purchases made by consumers (i.e. downloadable coupon redeemed in-store). Fast forward a few years and 2017 data continues to prove that physical store locations still have a tremendous impact in driving revenue for franchise systems and multi-location brands. More than 90% of retail sales still occur within physical business locations. However, as more brand marketing dollars continue to shift toward being spent on digital channels, how do brands know that their advertising is leading to customer store visits and, ultimately, customer purchases?